I have absolutely no Italian in me (that’s what she said). Not a streak. Yet some of my favorite foods come straight from Italia. Put a bowl of fresh pasta, creamy risotto, or pancetta in front of me and I tune the entire world out to sing sweet nothings to my food. I’ve never stepped foot in Italy, but I assume everyone sings to their food there. If that is not the case, consider my heart broken. One of my favorite Italian dishes to make is risotto. It takes time, patience, and a little bit of love, but it is not the culinary version of Tour de France that everyone makes it out to be. It’s quite simple, really. If you know how to stir and wait you can make risotto. You start out with a little butter, olive oil, and chopped onions sauteing them until the onions are brown and sweet. Then you add the Arborio rice to toast and coat in the butter and onions. Using Arborio rice is extremely important, because it has a high starch content which creates that creamy consistency so desperately desired when making risotto. After the rice is toasted, add a splash of crispy white wine until it is evaporated, and then add one ladle of warm broth at a time, stirring in between and allowing the broth to soak in to the rice before adding another ladleful. As soon as the rice is cooked through but still firm to the bite, stir in freshly grated parmesan cheese and any other toppings you can think of. The sky is the limit with risotto. It’s a perfectly clean canvas to twist and turn to your liking. 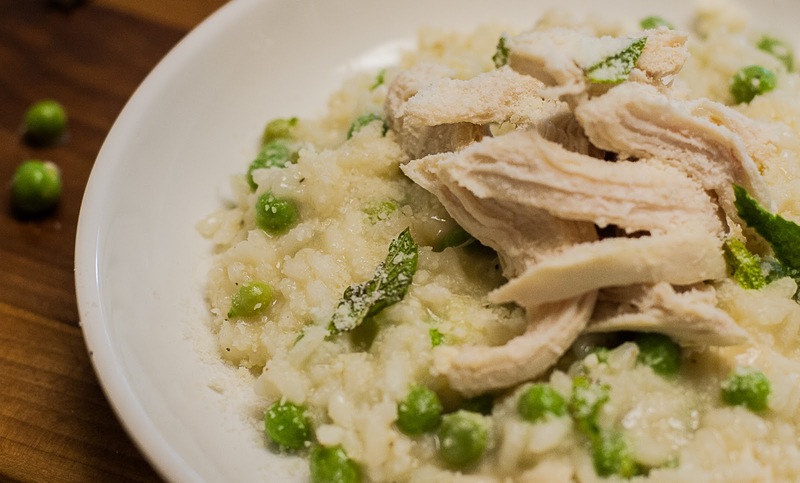 I tossed my risotto with warm fresh peas, poached chicken, and a heavy handful of mint to create a dish that felt much lighter for the summer. You can use the leftovers to make arancini di riso, little fried rice balls stuffed with melted cheese. So, be sure to make extra! Heat the chicken broth in a medium saucepan over medium heat. Add chicken breasts and thyme; poaching until cooked through; about 15 minutes. Turn the heat to low, remove poached chicken; cool and shred with your fingers. Remove thyme; discard. Keep chicken broth warm on low heat. Heat 1 tablespoon of oil and one tablespoon of butter in a large skillet over medium heat. Add onion and garlic, cook and stirring slowly until brown, about 10 minutes. Season with salt and pepper. Add the rice and stir until it is well-coated and opaque, 1 minute. Stir in wine and cook until it is almost evaporated. With a ladle, add 1 cup of warm broth and stir until the rice has absorbed the broth. Repeat 1 cup at a time, allowing the broth to absorb each time. The risotto is done when it is slightly firm and and creamy (if it appears mushy you have gone too far). Turn down the heat, add a pad of butter, parmesan cheese, and cook briefly until melted. Stir in peas, mint, and half the poached chicken. Top with a small handful of poached chicken and a sprinkle of parsley and mint before serving. I'm not Italian but with the way I eat I should be. Risotto takes forever, but it is the best! P.S. You cracked me up wit the "that's what she said." It may be the fact that I have not eaten since breakfast and it is now nearly 5pm, but this risotto looks like the most delicious thing I've ever seen. I love how fresh and summery this feels, great job! It is so true what you say about risotto - it simply requires patience. And I love the ingredients you've used here, so summery!